The wicked hands of majoritarian chauvinism have always tried to squeeze the identity and existence of marginalized communities through its clever tactic of othering and isolating people. History have witnessed, whenever such tendencies of racial and linguistic hatred have been unleashed it has brought misery to the weaker nations and unending guilt to those who practice it. But it seems humanity do not learn from history and so it repeat its mistakes time after time in all possible spaces on earth. Such an act of majoritarian exclusionary and divisive policies is manifested in the form of a National Registration Certificate in Assam, which identifies the Gorkhas and the Muslims as ‘outsiders’ in the NRC forms thus preparing them to be excluded from their rights in their own homeland. The NRC earlier had fixed the base year as 1951 as per which anybody who was enumerated in the NRC of 1951 and the electoral list of 1951 shall be declared as original inhabitant (OI) of Assam. But under recent specific government notification, the Gorkhas and Muslims are excluded from the category of OI in the NRC forms even though they had all the official documents proving their name enrolled in the NRC of 1951. Many British official documents(like by Krishna Ram Medhi, Sub Deputy Collector, Samuguri in 1937 and Deputy Commissioner of Darrang in 1937) shows that Gorkhas were living in Assam for about century with perfect harmony with the indigenous population. But situation changed after the beginning of Assam Movement in 1980s, when the Gorkhas, Muslims and some other linguistic and religious minorities were perceived by locals as cause of their underdevelopment and treat to their identity and opportunity. They were arbitrarily labeled as ‘immigrants’ who come to rob jobs and lands from the natives and some of them are labeled more brutally as ‘illegal migrants’. The irony is that even those people whose ancestors came during the British times and who have settled considering Assam as their home are branded as immigrants in popular culture. They are treated as undesirables in the society, thus ghettoizing and putting them under the lenses of suspicion always. The level of hatred towards these communities has always been at a high degree in Assam since many decades. 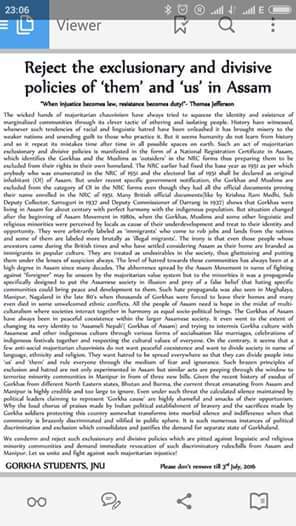 The abhorrence spread by the Assam Movement in name of fighting against “foreigner” may be unseen by the majoritarian value system but to the minorities it was a propaganda specifically designed to put the Assamese society in illusion and prey of a false belief that hating specific communities could bring peace and development to them. Such hate propaganda was also seen in Meghalaya, Manipur, Nagaland in the late 80’s when thousands of Gorkhas were forced to leave their homes and many even died in some unwelcomed ethnic conflicts. All the people of Assam need is hope in the midst of multi-cultaralism where societies interact together in harmony as equal socio-political beings. The Gorkhas of Assam have always been in peaceful coexistence within the larger Assamese society. 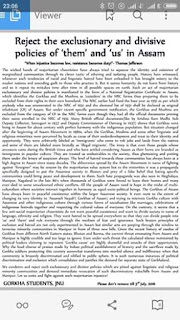 It even went to the extent of changing its very identity to ‘Assameli Nepali’( Gorkhas of Assam) and trying to intermix Gorkha culture with Assamese and other indigenous culture through various forms of socialisation like marriages, celebrations of indigenous festivals together and respecting the cultural values of everyone. On the contrary, it seems that a few anti-social majoritarian chauvinists do not want peaceful coexistence and want to divide society in name of language, ethnicity and religion. They want hatred to be spread everywhere so that they can divide people into ‘us’ and ‘them’ and rule everyone through the medium of fear and ignorance. Such brazen principles of exclusion and hatred are not only experimented in Assam but similar acts are peeping through the window to terrorize minority communities in Manipur in from of three new bills. Given the recent history of exodus of Gorkhas from different North Eastern states, Bhutan and Burma, the current threat emanating from Assam and Manipur is highly credible and too large to ignore. Even under such threat the calculated silence maintained by political leaders claiming to represent ‘Gorkha cause’ are highly shameful and smacks of their opportunism. Why the loud chorus of praises made by Indian political establishment of bravery and the sacrifices made by Gorkha soldiers protecting this country somewhat transforms into morbid silence and indifference when that community is brazenly discriminated and vilified in public sphere. It is such numerous instances of political discrimination and exclusion which consolidates and justifies the demand for separate state of Gorkhaland. We condemn and reject such exclusionary and divisive policies which are pitted against linguistic and religious minority communities and demand immediate revocation of such discriminatory rules/bills from Assam and Manipur. Let us unite and fight against such majoritarian injustice! Reject the exclusionary and divisive policies of ‘them’ and ‘us’ in Assam - JNU Gorkha Students - The wicked hands of majoritarian chauvinism have always tried to squeeze the identity and existence of marginalized communities through its clever tactic of othering and isolating people.